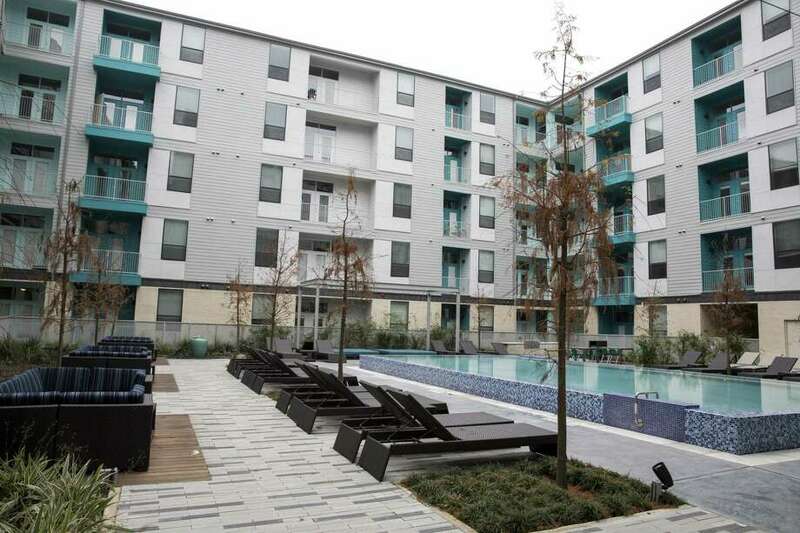 The Agave, a 349-unit apartment complex, is on the border of downtown and King William. Castle Lanterra Properties of New York has acquired the Agave Apartments, a $78 million upscale apartment complex that suffered extensive damage in a three-alarm fire in December. The real estate firm purchased the 349-unit complex on May 9 from a partnership between South Carolina developer Greystar and the Carlyle Group, one of the world’s largest private equity firms, according to property records released this week. The purchase price was undisclosed. The original sale agreement was derailed by the fire. Greystar has agreed to continue making repairs as part of the new sales agreement, said Patton Jones, who helped broker the sale as vice chairman of ARA Newmark in Austin. The Agave brought a new level of luxury and pricing to downtown San Antonio’s apartment market when it was completed last year. Its two-bedroom units rent for between $1,700 and $2,725, according to its website. The complex, which is on the River Walk, is at around 93 percent occupancy, Jones said. The acquisition is Castle Lanterra’s first foray into the San Antonio market, said Mike Kim, a vice president at Castle Lanterra. The firm owns about 1,700 apartment units in the Austin area and has been taking a close look at the population growth along the Interstate 35 corridor, he said. It is interested in making more investments in the area, he said. San Antonio is “attracting a lot of Millennials who are very well-educated, well-compensated, with a lot of disposable income,” Kim said. He also cited the city’s diversifying economy and its growing number of jobs in the technology and engineering sectors. Kim and Jones declined to share the purchase price. The property was valued at $78.1 million this year by the Bexar Appraisal District. San Antonio has lately been seeing an influx of out-of-state buyers acquiring local apartment complexes. Investors have said they’re attracted to the Alamo City’s strong job and population growth and its diversifying economy. On May 1, a partnership affiliated with CWS Capital Partners of Newport Beach, California, purchased the Avana at the Rim luxury apartment complex at the thriving intersection of Interstate 10 and Loop 1604. The complex was valued at $43.3 million this year by the Bexar Appraisal District. CWS declined to comment on the sale. All in all, investors have bought six major local apartment complexes with a combined value of $270 million since late April. The area around Agave is developing fast. Two apartment complexes are being built across the river. The complex is a few blocks east of H-E-B’s South Flores Market grocery store, and a few blocks west of the redevelopment of Hemisfair. The trendy King William neighborhood is just to the south.